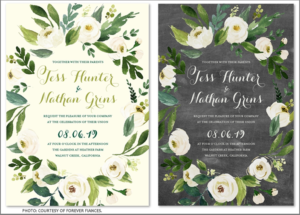 Plan a Socially Responsible Wedding with Eco-Friendly Invitations! Your wedding day can be spectacular, amazing, and even over-the-top, while still being kind to the planet! One option for “going green” and reducing your big events’ carbon footprint is by choosing eco-friendly wedding invitations. If you’re worried that sustainably sourced and socially responsible invitations will be more expensive – or less attractive – than traditional invites … think again! Wind + James stays on the cutting edge of wedding styles, trends and designs in order to help you plan the perfect ceremony and reception. In this article we tell you where you can find environmentally sound wedding invitations that are every bit as elegant – and no more expensive – than conventional invitations. Paper Culture is an online printing company that offers modern style invitations, all of which are printed on recycled paper. As an added bonus, the company plants a tree for every order that is placed! Your wedding will be “green” and your love will be beautifully memorialized with a living tree. Paper Culture specializes in simple, chic, no-frills designs – the perfect statement piece for modern, urban or industrial themed weddings! 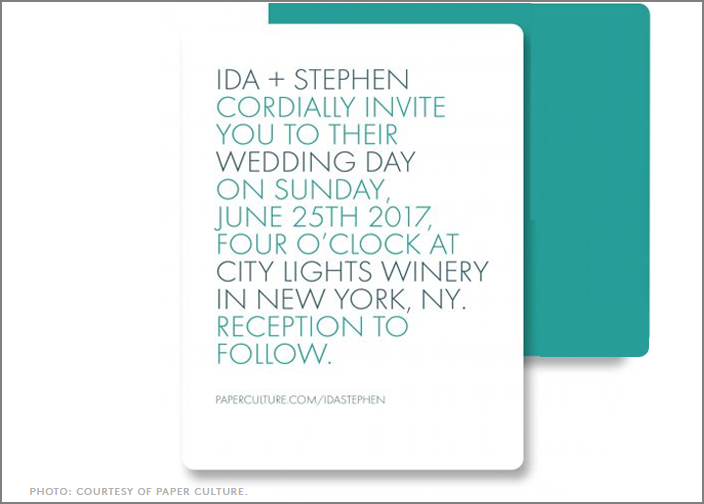 1440 NYC is a New York based design studio that specializes in wedding invitations printed on sustainable, ethically sourced card stock. The company offers couples across the globe personalized design services through their online design shop. High quality card stocks & printing processes leave recipients surprised when they learn the invites are actually eco-friendly! 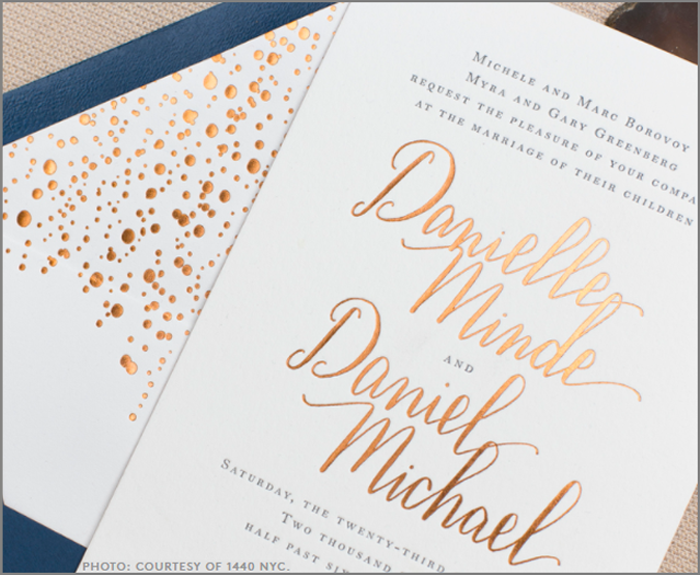 A wide array of invitation styles – from chic & modern, to classic & elegant – ensures something for every taste! Forever Fiancés offers a wide selection of rich colors, luxurious textures & attractive designs – all on 100% recycled paper. In addition to being beautiful, these invitations can give your budget a boost – because you can save up to 40% when ordering on their 100% recycled paper. 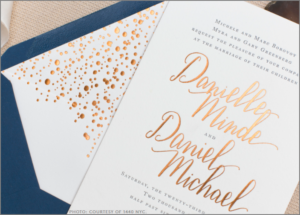 Their high print quality and premium paper will impress your recipients – while you have the satisfaction of knowing your wedding is eco-friendly & socially responsible! For the ultimate in tree-friendly options, some couples are even going completely paperless and sending e-invitations! While this option may not be for everybody, it can be ideal for those on a smaller budget. 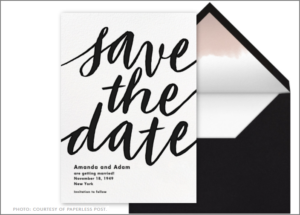 Or, consider going digital with “Save the Date” e-cards and rehearsal dinner invites – and then splurge on paper invitations for the wedding itself. 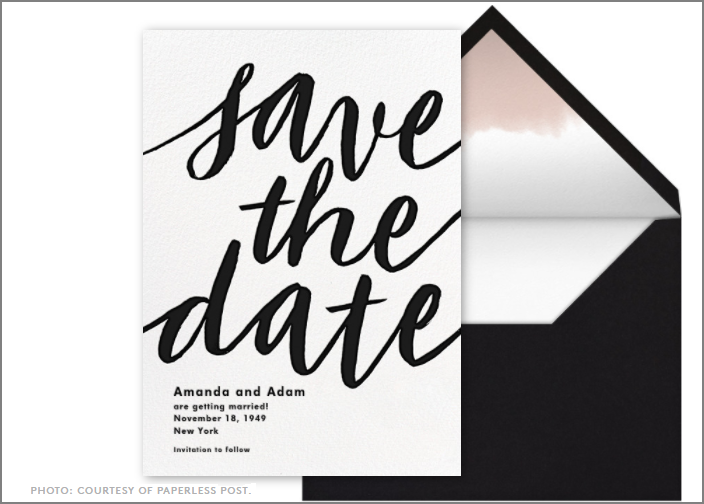 Paperless Post allows you to personalize beautiful e-invites to fit your taste, with designs by renowned and up-and-coming designers including Kelly Wearstler and Darling Clementine. Almost all of Paper Post’s digital designs are also available in traditional paper versions, too!